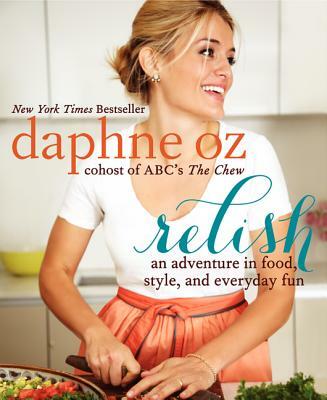 Relish by Daphne Oz – bestselling author of The Dorm Room Diet, cohost of the hit daytime talk show The Chew, and daughter of Dr. Mehmet Oz – offers simple, practical, and personal advice to help you live your better life right now. Daphne Oz made a splash by sharing her secrets for avoiding the dreaded Freshman Fifteen in the perennial bestseller The Dorm Room Diet. Now, this lifestyle guru shares essential advice on how to relish your food, your home, and your life in order to maximize health and happiness. Illustrated in full color with beautiful food and recipe photos, images of real-world and aspirational decor examples, and lots of creative lifestyle ideas, Relish: An Adventure in Food, Style, and Everyday Fun will help you envision a life that’s highly desirable and eminently achievable. Daphne Oz believes in happy, healthy living based on the successful strategies she developed to permanently shed more than thirty pounds while still enjoying all the foods she loves. She is all about finding innovative ways to fill her life with smart, accessible luxury and sharing her practical tips for making the process fun and easy. A 2008 Princeton University graduate, she is cohost of ABC's hit show The Chew, coauthor of the New York Times bestseller The Chew: Food. Life. Fun., and author of the national bestseller The Dorm Room Diet. Daphne has been featured in the New York Times, Wall Street Journal, Washington Post, Reader's Digest, Glamour, Teen Vogue, Seventeen, Cosmopolitan, People, and US Weekly; cohosted The View; and appeared on Good Morning America, Fox & Friends, The Dr. Oz Show, and NPR's Weekend Edition. Daphne received her chef's degree from the Natural Gourmet Institute and is a graduate of the Institute for Integrative Nutrition. She lives with her husband, John, in New York City.